Mini Portable Potty Discreet Portable Urinal Pouch 3pk. 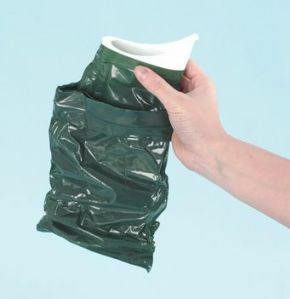 Discreet portable urinal pouch ideal for any situation where access to toilet facilities is limited. Suitable for men, woman and children. It turns up to 600 mls of liquid into gel. Leak proof and orderless. May be used until full. Sold in packs of 3. Great for travelling , easy to dispose of .